If you’ve been into recording music for any amount of time, you are probably familiar with Shure. 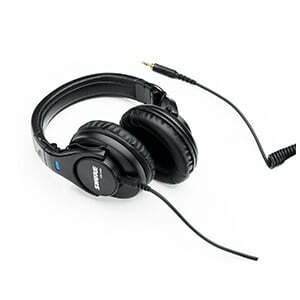 Aside from their iconic microphones, they also have a line of great studio headphones. With that said, Shure SRH440 is one of the best performing studio headphones under $100. Let’s find out why. One thing that becomes apparent when you come for a closer inspection, is that Shure went with function over form. It feels like everything about SRH440 was designed to improve performance. Even if you look into smaller details. If something wasn’t absolutely necessary, it never reached the final design. 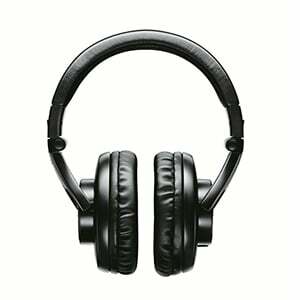 While simplicity has its obvious advantages, the disadvantage is that you are looking at a fairly bland set of headphones. At least from an aesthetic point of view. Shure SRH440 come in all black, with a familiar frame design. The only thing that breaks up the monotony here are the blue and red orientation indicators. Red is for right and blue is for left ear cup. A pretty nifty design from a practical point of view, but also an interesting way to add some flavor to an otherwise basic-looking set of headphones. In terms of hardware, Shure covered all of their bases. For starters, they went with a very well balanced 40mm drivers. They probably could have gone with a set of 50mm units, but as it turns out, that wasn’t necessary at all. Because of that, and a very smart frame design, Shure SRH440 ended up being extremely light. Without the cable, the weight was some 180 grams. The heaviest component in the whole story is the cable. When it comes to raw specs, Shure SRH440 covers a frequency range of 10Hz – 22kHz, at 105dB SPL. The impedance is set at 44 Ohm, which makes the use of Shure SRH440 on mobile devices somewhat questionable. However, when plugged into a workstation, these work without an issue. Overall build quality is great. Shure made sure that SRH440 were sturdy and rugged enough for proper studio use. So far, everything we’ve described led to one conclusion, and that is that Shure SRH440 packs a serious performance. In a way, that is true. The response is very well defined and balanced. When it comes to transparency, it’s definitely there without any considerable bias in the frequency range. Discrepancies from the 0 EQ measure in couple of dB at most. That’s more than acceptable considering the price of these headphones. Where the practical value of Shure SRH440 really comes to focus is when you put them to use. They are super light, allowing for longer use without suffering any fatigue. 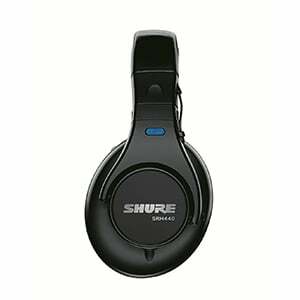 If you need a solid set of studio headphones which can operate around the clock without becoming a nuisance, Shure SRH440 is a great choice. Shure may not have designed the most efficient set of studio headphones, but they did create something that was easy to use every day. When put on paper, Shure SRH440 offers a configuration of performance, design and features optimized for those who spend a lot of time in a studio. They are super light, making them almost unnoticeable during frequent use, while they also pack just enough transparency where you can properly mix tracks. For more info about the Shure SRH440, click here.